CITY HALL — The City Council is poised to renew — for a second time since President Donald Trump took office — the city’s "sanctuary city" policy designed to protect undocumented immigrants from deportation. The resolution was approved unanimously by the City Council's Human Relations Committee, which heard emotional testimony by several Chicagoans who said Trump's efforts to deport immigrants here without proper documentation had upended their lives. The resolution, set to be considered by the full City Council March 29, also asks the president not to deport veterans who have served in the armed forces and not to revoke the legal status of immigrants who came to America as children, known as "dreamers." Several speakers decried the order by an immigration judge to deport Chicagoan Miguel Perez Jr., who served two tours of duty in Afghanistan where he suffered a brain injury in an explosion. Perez lost his legal status after he was convicted of selling more than two pounds of cocaine in February 2010. An appeal is pending. 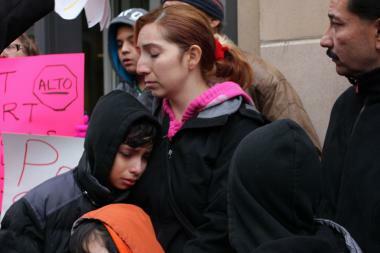 An estimated 183,000 Chicago residents are undocumented, data shows. Despite promising to do so on "Day One," Trump has taken no action to end the program that gives legal status to immigrants who came to America as children. Despite the effort to renew Chicago's protections for undocumented immigrants, the revised resolution does not close what several groups made up of Black and Latino Chicagoans have called "loopholes" in the measure. The groups want the City Council to stop any cooperation with federal deportation officials and called on officials to reduce arrests and stop using a database of suspected gang members. Trump has vowed to punish cities that protect undocumented immigrants from deportation by yanking their federal grants except "as deemed necessary for law enforcement purposes." Mayor Rahm Emanuel has said Chicago will remain remain a sanctuary city despite the president's threats. An analysis by the Center for Tax and Budget Accountability, a Chicago-based bipartisan think tank, said Trump would need Congress' approval to yank all of the city's federal funding, which is expected to total $1.3 billion, about 14 percent of its 2017 budget. That would likely prompt a court challenge on the basis that federal law prohibits officials from putting "strings on a particular federal grant if they have nothing to do with what the grant pays for," according to the center's analysis. It is far more likely that the federal government would pull all funding related to immigration and law enforcement, which would total $78 million in 2017 — or less than 1 percent of the budget, according to the center's analysis. But some legal scholars said the Trump administration could also try to yank funding from the Chicago Public Schools and the CHA, which are governed by boards appointed by the mayor. Chicago's status as a sanctuary city dates to 1985, when Mayor Harold Washington prohibited city agencies from asking people about their immigration status, though the Chicago Police Department runs background checks on criminal suspects. Trump made immigration a central issue of the presidential campaign. He has vowed to build a wall between the United States and Mexico, to deport 11 million undocumented immigrants and to ban Muslims from entering the United States. There are 37 sanctuary cities in the United States, including New York, San Francisco, Los Angeles and all of the nation's biggest cities. Included in the mayor's proposed 2017 budget is $1 million to establish a municipal identification card for undocumented immigrants.